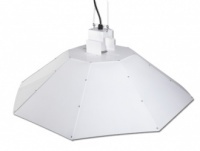 Highly recommended for tents and any growing environment where heat is an issue, Parabolic Grow Lights are one of our best selling grow lights. In a standard reflector the lamp is mounted horizontally with the light and heat being directed downwards to the area directly beneath the reflector. With a Parabolic, the lamp is mounted vertically allowing heat to be directed away from the plants.